TensorFlow plug-in recently launched by Quobyte for its distributed file system proves to enhance throughput performance by 30 percent for Machine Learning (ML) training workflows. Probably this is the first of its own kind of plug-in for a proven enhancement in machine learning capabilities. Quobyte is among the top developers of modern storage system software. The Quobyte Data Center File System is the world’s first distributed file system to offer a TensorFlow plug-in that empowers its customers with increased throughput performance with linear scalability for ML-enabled enterprise applications. This, in turn, enables faster and uniform training across larger data sets. Obviously, it automatically ensures higher-accuracy outcomes thus enhancing business’ decision-making capabilities. Any business decision loses its sanctity if not taken in time. A delayed business decision, obviously, causes damage to business growth. The plug-in, in fact, is an open source library for numerical computation. TensorFlow fits all businesses as it is an open source library. Further, with its numerical computation capabilities handling large data sets, it promises to evolve large-scale machine learning that is already setting its root among various technology segments across industries and institutions like autonomous vehicles, financial services, robotics, government, defense, aerospace, and so on. The scope is endless. It is only how much an industry can leverage its power to enhance decision-making capabilities. With the help of Quobyte storage and TensorFlow, any industry vertical can simplify and streamline their operation of machine learning. The plug-in enables TensroFlow applications to communicate directly to Quobyte by bypassing the operating system kernel. This substantially reduces kernel mode context switching which in turn ensures lower CPU usage. The best part is Quobyte storage can work with all stages of ML thereby increasing GPU utilization from the TensorFlow plug-in. Apparently, increased GPU utilization from the TensorFlow plug-in significantly improves model training of ML workflows. Users gain the flexibility to train anywhere. The models can move flawlessly into production. Since the plug-in has nothing to do with the kernel, it works with any version of Linux providing a high amount of flexibility in deployment for use in ML. As a matter of fact, you don’t require any kind of application modifications while using Quobyte TensorFlow plug-in. “A central topic of my essays is cybersecurity. “People and organizations need to trust that their digital technologies are safe and secure; otherwise they won’t embrace the digital transformation. “I advocate a Systems Thinking approach in educating our readers, followers, friends, business associates on digital transformation, emerging technologies and cybersecurity. Systems thinking forever changed the way I think about the world and approach issues. “The discipline of systems thinking is more than just a collection of tools and methods. “Why is cybersecurity so hard? “With hope to create and scale globally an inclusive ‘authors-publisher-readers’ circle of wisdom and expertise; with channelled determination to gain understanding by carefully selecting the best information sources (Dis Moi où Cherche! Mais où?) and reading between the lines, multiplied by expressed interest for knowledge sharing by the industry experts, and as part of my ‘Top Cyber News’ extended roundtable series; I brought in one-of-a-kind ‘Men on the Arena’: Charles (Chuck) Brooks, Stewart Skomra, Mike Quindazzi, and Scott Schober to create a series of articles ‘The Globality Quotient: Cybersecurity’ published by Dennis J. Pitocco, BizCatalyst360 – an award-winning digital magazine. Cybersecurity – What is Ethical Hacking or a Hacker is a Hacker. Digital transformation has a different meaning and perspective for different individuals and organizations. Let us see from the perspective of leaders in this arena through some classic digital transformation quotes. Enterprise Digital Transformation has become a buzzword these days. You attend any technology event and you find its mention there. In one form or the other. There are many masters emerging in this field. Organizations are claiming fast their adoption of this journey. It matters a lot whether they are taking it as a fancy journey or have some meaningful business-oriented goals in mind to achieve. There are many master concepts emerging in its name. A lot of vendors are emerging with some very beautiful and lucrative concepts for your organization to adapt to become a digitalized organization. A lot of business deals are happening in their name. Whether these deals are able to see the day of the light is something that needs to be seen. Because after all, it’s your money that is going into the vendor’s pocket. The capability lies not in solution but results. Digital Transformation is also omnipresent these days in any technology publication. Be it online or print. But I feel, it is more of making noise than achieving something significant in enterprise digital transformation. Let us understand the top 10 killers in an enterprise journey that misleads them from a real path of digital transformation. The first and foremost is = DIGITAL TRANSFORMATION CAN’T HAPPEN ALONE OR IN ISOLATION. Most of the organizations fail in their journey because either their understanding level is quite low in this regard. So they fail to understand the real idea behind it. Or it is the driver of their journey who acts weird. This is not a journey of haphazard ideas and goals. Everything is interlinked. It has to be sequential with a single major milestone to achieve one at a time. There can be though micro-segments or parallel sub-milestones to achieve in that. The top two things that come to my mind for achieving significant success in enterprise digital transformation are data and people. Digital transformation carries a different meaning for different organizations and individuals. The course of digital transformation also depends on the current level of any organization in this foray. For instance, an organization with zero digital initiatives will have a different course of action as compared to an organization already ten steps ahead to the former. On the other hand, a number of startups are taking very innovative initiatives and transforming the world in a real digital way. One such example in this segment is Escher. Escher is an organization that has a clear focus on modernization of global Posts for which the best way is to ensure a superb customer engagement platform. This customer-centric approach definitely helps in achieving business goals on better terms with their customers without any compromise in quality of service or product. What Escher is doing is probably one of its own kind of initiative. The core strength of Escher lies in its innovative customer engagement mechanism that has become a benchmark for others. Their vision is to enable posts to leverage digital transformation technologies to drive the whole ecosystem with greater speed and better economics. As a matter of fact, this is the first customer engagement application for posts. Currently,35 postal and courier customers are using this platform globally. The application is helping them to shorten the gap between the quality of service in comparison to their counterparts in the private segment. The private shipping companies, in fact, are equipped with better systems as they can afford to pay higher costs. On the other hand, globally, all customers expect a flawless experience despite all kind of digital disruptions happening across the globe. Irrespective of their locations, almost all customers have similar kind of expectations that are real-time informative as well as interactive. Nick Manolis, chief executive officer of Escher says, “Today’s postal customers have options for doing business, and we are focused on helping postal operators and couriers meet customers’ high expectations by evolving into digitally-driven, multi-channeled organizations. 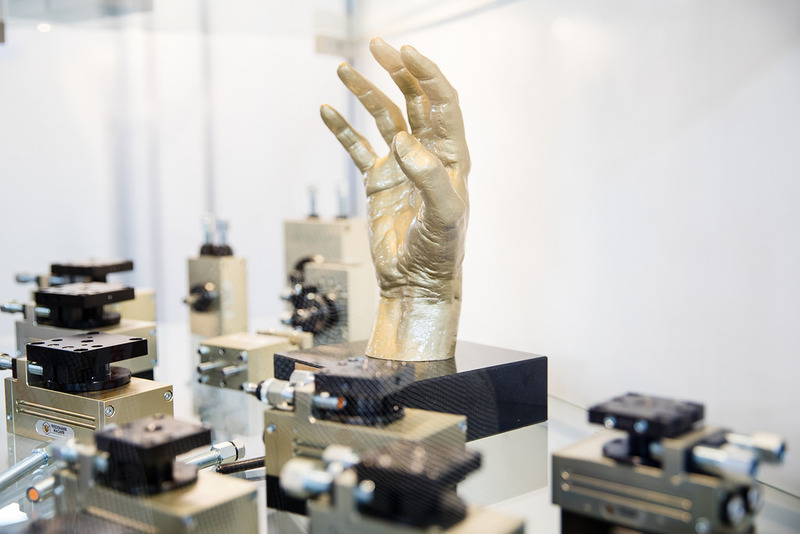 The Escher platform goes beyond a counter solution in posts’ retail stores. We help posts meet customer demands on their terms.” He further adds, “At Escher, we understand postal and courier operations and the pressures and constraints they face, and we have invested over $80MN in R+D for customer-focused technology. We are dedicated to helping modernize postal and courier operations using the expertise we have gained over two decades in helping to transform over 35 postal and courier operations globally and processing more than two billion transactions annually”. MapR announces MapR AI Edge Program. This program benefits all NVIDIA Inception startup members with a free MapR enterprise license. This is something phenomenal. And it means a lot for the startup community. What it means is that all NVIDIA AI startups can boost their AI development lifecycle with MapR Data Platform. That too with no additional investment. MapR, as we all know, is the visionary creator of next-generation AI and Analytics Data Platform. MapR AI Edge Program, in fact, is an AI accelerator program completely free for this exclusive segment. 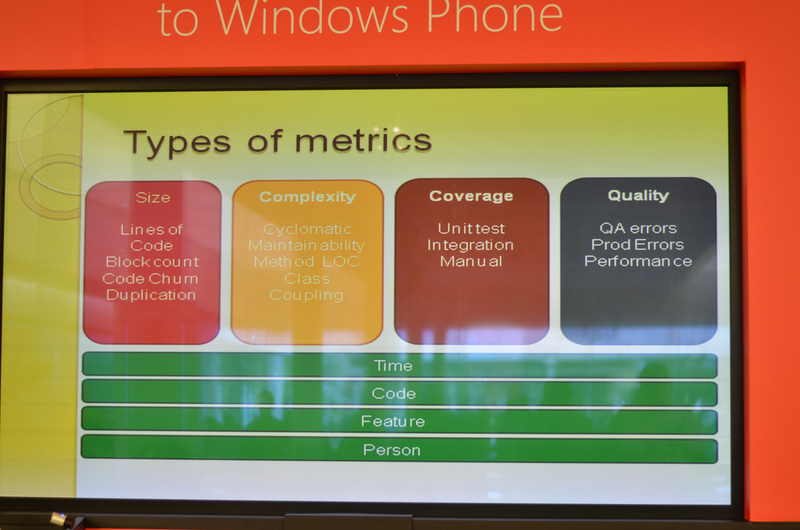 This enables deployment agility along with data management. This applies to any kind of data between and across edge, on-premise, and cloud. And it covers all Machine Learning (ML) and Artificial Intelligence (AI) products. Probably it will be of great help to Startups working in these respective fields. They get a number of opportunities and enhancements at no cost. Jack Norris, Senior Vice President, Data and applications, MapR says, “Customers will be able to provide more impactful demos of their AI product by running GPUs anywhere and being able to take advantage of all of the features and capabilities built into MapR. MapR AI Edge Program enables faster deployments and the ability to spotlight NVIDIA in mixed-use environments, eliminating barriers and expediting value creation of AI apps from development to testing and demonstration.” In fact, MapR Enterprise License is a bonus for the startups working in this arena. It will definitely help them to accelerate their business giving them new dimensions to achieve faster deployments. It is going to give them multiple benefits. MapR Enterprise License comes with no storage limitations that gives startups a free hand to develop, test, and demonstrate products. It’s a boon for the startup fraternity. A must grab benefit for them. MapR Enterprise License free for startups will include a number of benefits for them to thrust their business in the right direction. To know more visit here. The whole world knows the value of quality and how much it matters in terms of loss and profits, then why the top retailers across the world failed to adhere to its standards and procedures as per 2019 Retail Quality Report? One thing I always fail to understand – the real cause of failure in quality measurements. Is it due to time limitations? Is it there too much to achieve? It might be a lack of knowledge. It might be the absence of confidence. Rather, it might be a result of overconfidence. It could also be the result of the right set of people to achieve it. There could be other reasons that probably my readers can pinpoint in the comments section of this article. Let us try to examine these reasons one by one. Whatever is the case, these reasons can lead to big losses, blunders, and failures. The first reason that comes to my mind is time limitations. If it is too much work to do in too short a period, then it is foolish to start it. It is foolish, in fact, at the management’s end to undertake these kinds of projects. As a matter of fact, the whole project should be broken into two proportions of 80:20. Segregate the goals. Sort out the top 20% of most important ones and then spend the whole time in achieving those with full dedication of analysis, development, and testing. These 20 top goals will get you more than 50% of the results that you were planning to achieve with a whole lot of objectives. Finding the right reason is of utmost importance when it comes to quality. Applause, a global leader in digital quality and testing through crowdsourcing, releases its 2019 Retail Quality Report recently. It is important to go to the root cause of the reasons causing these failures. It is equally important to ensure the same mistakes don’t repeat this year. Otherwise, the whole purpose of 2019 Retail Quality Report gets defeated. Formulus Black, a ventured startup, creates a new landmark in computing by changing the whole paradigm. It is something that is happening for the first time in the world. While so many giants might have been struggling with this idea and finding ways to give it a real shape, Formulus Black breaks the barrier and takes a leap in a true sense by harnessing the power of in-memory compute for all applications. That is going to be a great boon for large and medium enterprises. The product, ForsaOS breaks the barriers between memory and storage thus giving a revolutionary direction to computing. This is something phenomenal. And at the same time is very crucial for the technology guys working in enterprises to understand the whole ball game. Because only then an enterprise reaps the benefits of this power of in-memory compute. In-memory compute not only enhances compute operations but saves humongous cost. This was in fact, a major issue being faced by all hardware and software giants to tackle in computing. With the launch of ForsaOS, Formulus Black not only addresses these major issues but also creates a new compute benchmark. ForsaOS is a complete Linux-based software stack that is designed precisely to run all applications in memory. This revolutionary technology brings a huge benefit in compute efficiency. This, in fact, results in a significant benefit in cost-effectiveness, processing speed, memory capacity, and data security with no changes in the application. Everything keeps happening as before with a heap of benefits in cost, speed, memory, and security. No sort of compression or encryption happens in this process. The software stack keeps data in persistent memory. This is the first time in the world a technology is launched that keeps data completely safe against power loss. That is a great achievement. Wayne Rickard, Chief Strategy and Marketing Officer, Formulus Black says, “The challenge within the computing industry continues to be how to achieve the fastest speeds with the lowest latencies needed to satisfy increasing demands of the compute side of the equation while overcoming the expense and limited capacity issues from the memory side required to achieve it. We have designed ForsaOS to address these issues by amplifying the memory. Because CPU to memory is extremely fast while I/O to external storage peripherals is slow, we have developed a software solution that utilizes fast DRAM memory as storage while providing all the necessary management tools and features needed to increase effective memory capacity by up to 24x while improving processing speed as much as 450x. For a demo or to get further details on it, you can visit here. Additional information on the company is available on their website. This is an interview with Jerry Melnick, president and CEO, SIOS Technology on SIOS DataKeeper. Jerry Melnick, president and CEO, is responsible for directing the overall corporate strategy for SIOS Technology Corp. and leading the company’s ongoing growth and expansion. He has more than 25 years of experience in the enterprise and high availability software markets. Before joining SIOS, he was CTO at Marathon Technologies where he led business and product strategy for the company’s fault tolerant solutions. His experience also includes executive positions at PPGx, Inc. and Belmont Research, where he was responsible for building a leading-edge software product and consulting business focused on supplying data warehouse and analytical tools. SIOS Technology provides IT Resilience for critical applications like SQL Server, Oracle, and SAP in the cloud, hybrid cloud or datacenter. Using SIOS high availability clustering software, applications automatically recover from infrastructure and application failures in a matter of minutes with no loss of data, keeping data protected, and applications online. SIOS was founded in 1999 and is a subsidiary of SIOS Corporation, a publicly traded company based in Japan (TYO:3744). The company is headquartered in San Mateo. SIOS software runs business-critical applications in a flexible, scalable cloud environment, such as Amazon Web Services (AWS), Azure, and Google Cloud Platform without sacrificing performance, high availability or disaster protection. 1. What is SIOS DataKeeper all about? SIOS DataKeeper software is an important ingredient in a cluster solution that lets users add high availability and disaster recovery protection to their Windows cluster or to create a SANless cluster for complete failover protection in environments where shared storage clusters are impossible or impractical, such as cloud, virtual servers, and high-performance storage environments. Clusters built with SIOS software protect applications including Microsoft SQL Server, SAP, SharePoint, Lync, Dynamics, Hyper-V, and more from downtime and data loss using a SAN or SANless cluster in physical, virtual, and cloud environments and provide enterprise-class protection for all server workloads at a fraction of the cost of array-based replication. 2. 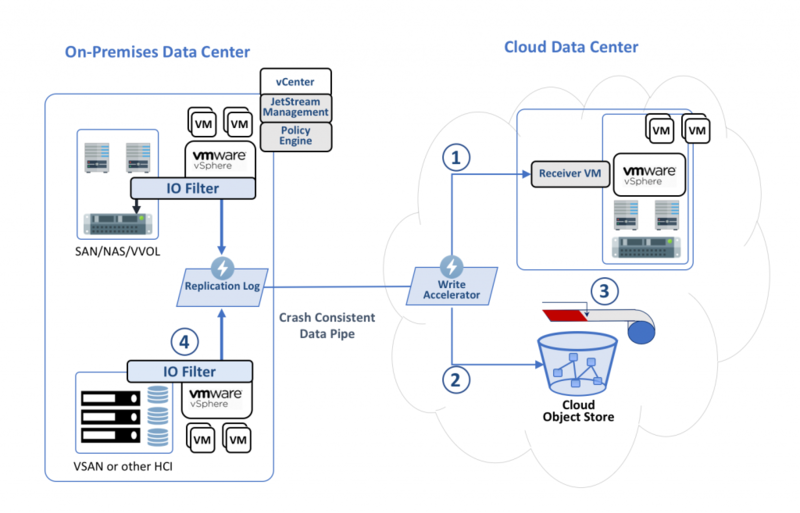 How does SIOS DataKeeper ensure high availability for critical applications of an organization? SIOS DataKeeper eliminates the need for complex and costly hardware SANs when configuring systems for high availability or disaster recovery. It uses fast, efficient, block-level replication to transfers data across both local and wide area networks with minimal bandwidth. It delivers incredibly fast replication speeds without the need for additional hardware accelerators or compression devices. This allows companies to flexibly configure the optimal recovery environment to meet their business objects without the constraints of hardware SANs. 3. What kind of organizations fit in for having SIOS DataKeeper? SIOS software is used by companies large and small and by applications with just a few gigabytes of data to many terabytes. The software works with any Windows application transparently without modification. It is employed across a wide variety of industries. DataKeeper is used where a company’s day to day operations rely on the availability of the application. With over 70,000 licenses, many of the world’s largest companies use SIOS software to protect the applications their business depend on. SIOS software runs business-critical applications like SAP and databases such as SQL Server, Oracle, and many others in a flexible, scalable cloud environment, such as Amazon Web Services (AWS), Azure, and Google Cloud Platform without sacrificing performance, high availability or disaster protection. 4. How SIOS DataKeeper edges over other similar products in the market for its Cost-effectiveness and Application-agnostic Design? The extreme flexibility to create high availability clusters using existing hardware with or without a hardware SAN in both high availability and disaster recovery configurations is the key differentiator. You don’t need to purchase new hardware or learn new technology. DataKeeper works out of the box with Microsoft Windows Server Failover Clusters (WSFC) as a simple add-on and is installed and configured in minutes. Since it’s based on Windows and works at the operating system level, any application that runs on Windows can be protected by WSFC with SIOS DataKeeper. And you don’t need to change the application – it’s all transparent. 5. What advantage did ALYN Hospital get after deploying SIOS DataKeeper? ALYN Hospital IT was seeking to use existing hardware and their Hyper-V environment that was configured and operating in separate server rooms on-premises. They needed to achieve both high-availability with no loss of data and minimal uptime and disaster protection while providing them ways to maintain uptime during upgrades. SIOS DataKeeper gave them all of these capabilities without costly new expenditures or reconfiguration. The ability to create 3-node SANless failover clusters with a single active and two standby instances has proven to be especially valuable for ALYN’s needs. They are updating systems and software continuously, and with DataKeeper they can do that without any disruption to operations. Because the data replication supports multiple standbys and enables manual, dynamic assignment of the active and standby instances, the active instance can be moved to any server in a 3-node cluster and remain fully protected during periods of planned hardware and software maintenance. Other SIOS DataKeeper features that are important to ALYN’s needs include the ability to work with any type of storage and WAN-optimized data replication. The SIOS cluster seamlessly supports any storage volume recognized by Windows, and this substantially simplifies their operations while enabling them to utilize all of their storage resources. Additionally, the WAN optimization will prove useful as ALYN Hospital implements its remote disaster recovery site. ALYN Hospital is confident the SIOS SANless failover cluster will perform as desired when needed: They test the configuration regularly and routinely change the active and standby designations while redirecting the data replication as needed during planned software updates, and the applications have always continued to run uninterrupted. 6. What was their evaluation criteria? To evaluate third-party failover clustering software, ALYN Hospital established three criteria: The solution had to work with existing hardware; it had to provide both high availability (HA) and disaster recovery (DR) protections all of the hospital’s critical applications; and the total cost had to fit within the department’s limited budget. The IT staff quickly narrowed the third-party options to two, and after carefully evaluating both, found that only one met all of its criteria: DataKeeper from SIOS Technologies. While they needed a solution that was cost-effective, they were determined not to sacrifice quality or capabilities. With SIOS they found a solution that delivers carrier-class capabilities with a remarkably low total cost of ownership. 7. What are all the platform SIOS DataKeeper works on? SIOS DataKeeper software adds disaster recovery protection to a Windows cluster or to create a SANless cluster for complete failover protection in Windows environments where shared storage clusters are impossible or impractical, including any combination of physical, virtual, cloud, or hybrid cloud infrastructures. SIOS software runs business-critical applications in a flexible, scalable private or public cloud environments, such as Amazon Web Services (AWS), Azure, and Google Cloud Platform, hybrid clouds or on-premises datacenters. SIOS also offers SIOS Protection Suite for Linux which is one of a suite of Linux and Windows clustering solutions offered that use artificial intelligence (AI) to improve IT resilience, maintain uptime and lower operational costs. Munson Healthcare is the largest healthcare system in Northern Michigan. They currently have more than 540,000 unique patients across 30 counties. There are nine community hospitals in this huge network. To manage such a huge customer base, having an accurate and comprehensive record of patients data had become a prime necessity for them to operate flawlessly. After all, healthcare is all about the highest quality of patient care and productivity for users. There was an asking for a new EMR to enhance operational efficiency. The motive was also to ensure compliance with increasing regulations. Complete Data Accuracy Platform from Naveego was not in their procurement list still. It was assumed that the new EMR will be effective enough to manage their newly acquired hospitals, outpatient facilities, and practice groups. But the new EMR system was not able to help in data integration. Something was seriously missing. Munson’s staff was spending a substantial amount of time to manually document, execute, and validate data. In fact, data mapping was becoming a big pain. Despite investment in EMR, staff had to perform manual spot checks to validate successful migration of appointments. This was becoming a big overhead leading to escalating costs, time loss, and schedule complications. The entire initiative thus was heading towards failure. That is where their hunt for a Complete Data Accuracy Platform began. Naveego’s platform was the only system among many others to qualify to meet all their requirements to address the data accuracy challenges. With the new solution from Naveego in place, the Munson staff was able not only able to increase their efficiency manifold but adherence to processes also improved significantly. Everything was in place within a few days. It was an automatic creation and monitoring of quality checks. Munson Healthcare is quite happy after selecting Naveego Complete Data Accuracy Platform. They are able to manage, detect, and eliminate data issues well in advance. It is helping them to achieve significant cost savings. Naveego achieves it by connecting multiple data sources into a single EMR system. This makes proactively achieve Global Data Health for Munson Healthcare. Signalchip Launches Semiconductor Chips for 4G/LTE and 5G NR Modems. These are India’s first indigenous semiconductor chips. Fulfilling India’s Prime Minister Narendra Modi’s dream of ‘Make In India’. In fact, this is a phenomenal achievement. This newer silicon-chip technology innovation by Signalchip places India on the global map. Bengaluru once again proves to be India’s key technology hub. This fab-less semiconductor company has achieved something exemplary that many global companies would have been striving to achieve working in various parts of the world. Telecom Secretary Aruna Sundarajan was present at the launch. These are SCBM34XX and SCRF34XX/45XX series of chips. ‘Agumbe’ is the name given to these chips. It is a result of the hard work of more than 8 years. It involved deep research by engineers with a global level of capabilities working with Signalchip. This is totally a game changer in the global Telecom industry. Signalchip unveils four chips. SCBM3412 is a single chip 4G/LTE modem. It includes the baseband and transceiver in a single device. SCBM3404 is a single chip that is 4×4 LTE baseband modem. SCRF3402 is a 2×2 transceiver for LTE. SCRF4502 is a 2×2 transceiver for 5G NR standards. All LTE/5G-NR bands upto 6GHz are covered by the RF sections. India has its own satellite navigation system known as NAVIC. These chips support positioning using this satellite navigation system. Interestingly, Agumbe is a small remote village in Shimoga district, Thirthahalli taluk in the Malnad region of Karnataka, India and is also known as Cherrapunji of the South. This is because of the heavy rainfalls there. The Agumbe series builds upon SCRF1401. That is India’s first RF transceiver chip. It adheres to high-performance wireless standards such as 3G/4G and WiFi. It was designed by Signalchip in 2015. Database Activity Monitoring or DAM – Is it Important? Data is the new currency. Data Security has become one of the top priority of any organization. If we talk about the data security landscape for an organization, it comprises of seven components. These are – discovery, classification, prevention, Rights management, Access governance, Database activity monitoring, loss prevention. Database Activity Monitoring is one of the most important components among these. 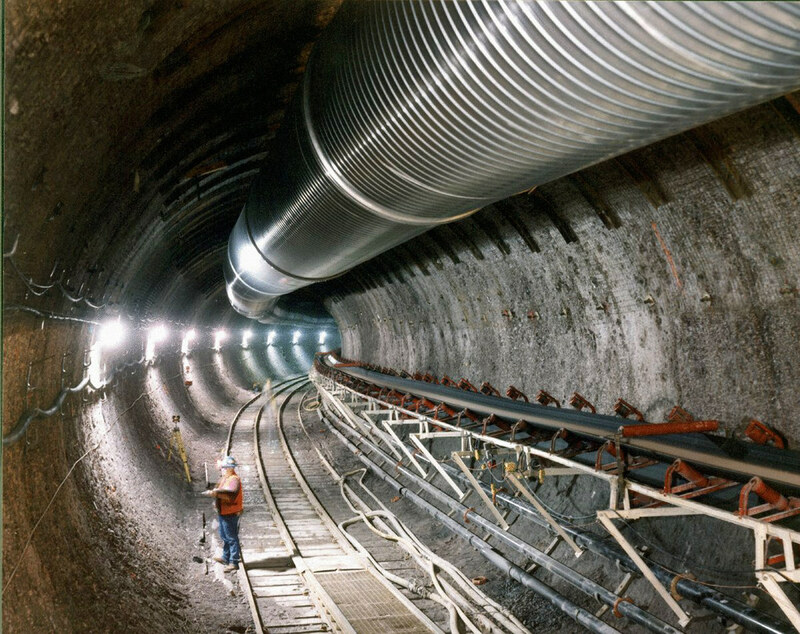 In fact, the scope of DAM covers analysis, monitoring, recording access and usage for any kind of anomalous activity. And then it also covers a strong mechanism of raising alerts to potential attacks and compromises. DAM tools, thus, monitor SQL traffic ensuring internal abuse prevention. In fact, the vendors providing active blocking are high in demand in this spectrum. When auditors talk about compliance and regulations like SOX, HIPAA, GLBA, PCI, etc, the DAM is of utmost importance. DAM tools are of two types. Database Activity Monitoring tools have two kinds of architectures. It could be network-based or agent-based. Most of the DAM vendors, in fact, rely on the technique of native audit capabilities in databases. Logically, any good DAM tool supports all kind of top range databases. These include Microsoft, Oracle, IBM, MySQL, MongoDB, Teradata, and PostgresSQL. As a matter of fact, most of the DAM tools come with additional features. These features have enhanced capability of looking into data security. This capability includes data discovery, classification, rights & access management, DLP (data loss prevention), and encryption. In fact, a few of these also cover security information and event management (SIEM) and log management tools. If we look at the top key players in the DAM space, there are many established and some new-age ones. The stalwarts include Google, Microsoft, Intel/McAfee, IBM, and Oracle. The new-age Database Activity Monitoring vendors include STEALTHbits, Zafesoft, BlueTalon, Imperva, Datiphy, Protegrity, Huawei (Hexatier), and DB Networks. A recent study says almost 40% of IT workloads are currently running in the cloud. In the next two years, this workload, on an average, will increase to almost 60%. With these changing scenarios of a significant shift in the cloud, the network performance monitoring requirements in organizations are changing at a faster pace. In fact, most of the organizations using traditional network monitoring tools feel these tools are not that effective and useful. It is because the tools are not designed to consider parameters related to the cloud. Most of the traditional tools are designed keeping an on-premise architecture in mind. That means, with more than 50% of the organization’s technology workload shifting in the cloud, the network performance monitoring vendors need to work on the newly evolved use cases and business scenarios to find out newer solutions catering to the latest needs of network monitoring. The newer network monitoring demands higher penetration in monitoring into networks connecting to cloud applications. As the workloads shift to cloud, the demand for insight into a network connecting to the cloud is becoming as critical as monitoring of on-premise networks. As the pressure is increasing for this new set of requirements, the network performance vendors are busy in innovating newer ways to achieve these goals. The interesting thing is so far it was about network monitoring of owned networks. In the case of the cloud, the requirement changes steeply to gain insights into a network that an organization doesn’t own. But since these external third-party owned networks are carrying important traffic related to an organization, its network insights becomes important. Irrespective of whether it is a SaaS model, other cloud-based applications, public networks, or private networks, the insights are equally important. So far, it was the deployment of network monitoring tools in your own networks. But that doesn’t hold good anymore. Now the boundaries are becoming boundary-less. Artificial Intelligence and Machine Learning (AI and ML) can act as a boon for an organization. It all depends on the appropriate use cases and their deployment. It is still to ascertain whether organizations prefer specialists over generalists or vice versa? Does an organization prefer full-time employees responsible solely for IT infrastructure? Or there is a shift from specialists toward generalists? Is manpower increase directly proportional to the increase in workload? Especially in IT organizations? I think it is not so. Despite increasing workloads, the ratio of new specialists is significantly low. That means specialists within the organizations are being asked to becomes generalists. That is because a generalist can take care of two or more than two different nature of jobs easily. While a specialist keeps himself stuck to only a specific nature of the job. That is where the significant role of AI and ML comes in. As a matter of fact, tagging people as specialists have their own merits and demerits. More demerits, I think. But in most of the organizations, IT professionals have to do more with less. Deliverables are increasing. Timelines are shrinking. And expectations of top management are on the rise. In that case, the only savior of an organization is to take help of AI & ML. It is necessary, thus to get in products that are either capable to capitalize on artificial intelligence and machine learning. Or those can be made capable of with a little of tweaking here or there. Once this starts happening, the IT staff will be able to predict problems well in advance. Rather, in some cases, it could be well before the problem occurs. These products, in fact, provide a simple way to manage infrastructure in a better way. Basically, automation is the only possibility. In order to avoid the complexity of finding highly skilled specialists and to save a substantial amount of recurring cost to the organization, AI and ML is the solution. Are you joining me this June to attend 2nd edition of the Global LiFi Congress in Paris? It is on June 12 and 13 happening at Salons Hoche (near the Arc de Triomphe). If you decide to join and need a special discount, do let me know. All the players in the scientific world including the business people in relevant fields and global press & media are quite enthusiastic. The first edition of the World Congress was a big hit. The media coverage was from across the globe. Within a short span, it has already established itself as a unique professional platform of repute. Before going further in detail about the event, let us understand what this technology is all about. LiFi technology transmits data and location. It uses light rays via LED lights to perform it. The two days are going to be of collaboration and learning. Basically, it is a parallel technology to WiFi that uses radio waves to get the same. The first Global LiFi Congress was very insightful. Speakers with their expertise enlightened attendees on various topics like the efficiency of LiFi in modern-day infrastructure setups such as smart cities. It also covered LiFi in reference to 5G communication networks and so on. As a matter of fact, the first edition of the World Congress witnessed all the major players of LiFi like Renault, EDF, Signify, RATP, OLEDCOMM, etc. This year the participation is definitely going to be much higher than last year looking at the zeal and response from across the globe. The congress aims to align technology and business experts so that they can collaborate to explore all possible offerings of LiFi technology. That is ultimately bound to open a large number of opportunities in those two days. There would be many key focus areas of the second edition of Global LiFi Congress in Paris this year. These include logistics, transportation, cybersecurity, aeronautics, R&D, Robotics, AI, IoT, Greenfield, and so on. Scientists and scholars would be talking about the latest developments and emerging new standards in this field. In fact, the significance of LiFi is not limited to businesses. It can do wonders for communities as it is a breakthrough technology having ample scope in everyday life. As a matter of fact, LiFi can amplify the benefits of many existing technologies and applications. Hope to see you all there on June 12 and 13. By the way, why don’t have a look at the following video? Today’s workforce demands dynamic creation tools. Static tools with orthodox features are becoming obsolete. The first three posts on Zoho Office Suite can be accessed here by clicking on these respective links – Post 1, Post 2, and Post 3. In this final post, I would be touching upon some of the key features of Zoho Office Suite that makes is a set of Dynamic Creation Tools. Let us start with Zoho Writer. Zoho Writer has built-in automation features. These are – document merging, form-based document creation, fillable documents, and one-click signature collection features. The user can also work completely offline while working on Zoho Writer on the web, iPad, or mobile versions. The document automatically syncs to the user’s account once the connection revives back. There is a distraction-free mode in Zoho Writer. All pings and pop-ups get disabled in this mode. Similarly, there is a focus mode. In the focus mode, Zoho Writer highlights the paragraph the user is working on while it dims all other text in the document. To bring back the old memories of working on a typewriter, the user can enable typewriter sounds. These are some of the dynamic creation tools I have mentioned. There are a lot more in the Zoho Office Suite. For instance, Zoho Show gets you a user-focused interface. The interface helps author populate slides faster. It also offers a variety of themes and options to include tables, path animation, charts, and smart elements. As a matter of fact, Zoho Sheet is the world’s first spreadsheet application that offers data-cleaning. This ensures the fixing of all inconsistencies and duplicate data. Zoho Show can talk to Apple TV and Android TV seamlessly. The user’s mobile becomes a controller in that case. With its help, the user can beam slides on multiple TVs. Deluge is another classic example of Dynamic Creation Tools that Zoho Office Suite presents. It helps users to create custom and personalized functions with the help of this proprietary scripting language. Zoho Office Suite pricing is most suitable for individuals, SMBs, Startups, and mid or large sized enterprises. For a single user, it is free. SMEs can avail it at INR 99 per user per month. Large enterprises can get it at INR 399 per user per month. This is the third post in this series of Zoho Office Suite. In the first post, we discussed the Suite. I talked about its components in the second post. In this post, we will elaborate on its components further. Also, I would talk about how these components integrate well to make suite a class apart. Overall, the suite helps in creating better document, spreadsheet, or note intelligently with the help of AI enriched Zia. The first component is the Zoho Writer. It is Zoho’s document creation application. Zia makes document creator’s life easier by helping in so many creative ways. Zia not only detects context-based grammar mistakes, but it also rates the overall readability score of the document. Not only that, but it also suggests style corrections to the user in a real-time environment. This helps the user to improve overall writing quality and a better document in place. While Zoho Writer is for creating documents, Zoho Sheet is for spreadsheets. Zia is here too to assist to a larger extent. In fact, Zia gets you deeper insights into data sets. It automatically shows you the most relevant charts and pivot tables drawn out with the data available. Zoho sheet also supports Natural Language Querying (NLQ). The user can ask Zia questions related to their data. Zia, in return, responds back intelligently with relevant function, pivot table, or chart that can be added to the spreadsheet. Next comes the Zoho Notebook. This is the newest entrant to Zoho Office Suite. It is one of the best and most advanced note-taking tool in the market globally. Zia Voice that is an intelligent conversational AI assist users to create customized “smart card” by providing visuals, shopping list, instructions etc. from their favorite websites. All through voice commands. How Zoho Office Suite Components Fit Well Into Enterprise Needs? In the previous post, we talked about the Zoho Office Suite. in this post, we would be talking about Zoho Office Suite Components and their integration capabilities. The good part is that all the Zoho Office Suite Components are integrated well among themselves. Not only that, these applications or the components are also integrated with Zoho’s communications tools like Zoho Mail and Cliq. This is a cross-platform messaging app. So, calling them Zoho’s collaboration tools will not be a misnomer. These collaboration tools include Zoho Projects and Zoho Connect. This is basically a private social network for an enterprise. The other collaboration tools include a number of other Zoho’s business applications. With the help of these contextual integrations, the user gets empowerment to merge data from Zoho CRM into a sheet or document. Then the user can send this data for signature through Zoho Sign. That creates a flawless workflow mechanism in its own ecosystem. Imagine the amount of work and efforts it saves in doing so in an automated or integrated manner. In this context, Sridhar Vembu, CEO, Zoho Corp. says, “We built Zoho Office Suite to be the most integrated suite of productivity tools of its kind. For decades, Zoho has provided tools for users to share and work on documents quickly and efficiently. Now, with this new version of Zoho Office Suite—empowered by Zia—Zoho’s integrations are tighter than ever before, providing seamless collaboration across departments and teams. We’ve added features and tools that can’t be found anywhere else, such as Notebook’s smart cards, Sheet’s data-cleansing tool, and Show’s integration with Apple TV. Just like the line between productivity and collaboration applications is fading, we see the line between business, collaboration, productivity, and communication apps fading. It is the combination of these apps, contextually integrated, that makes the modern worker exponentially more productive!” That is a wonderful perspective about Zoho Office Suite Components. Is this the one the ultimate office suite that is capable of catering to all your future needs? Well, you need to experience it and assess it for yourself. But one thing is for sure. It is far beyond what you and your enterprise are living with – whether Microsoft or Google. This one has an edge over both these giants in its true sense and in many ways. For that, obviously, you have to taste the pudding. Experiencing the Zoho Office Suite is not cumbersome. Rather, you will be happy to use it. It is, of course, the best enterprise office suite. This is the next generation office suite, in fact. Besides doing routine office suite tasks, it empowers businesses with dynamic AI features. And you also need to explore its first-to-market enhancements that are bound to make life a little comfortable for your marketing and sales staff. Zoho Office Suite comes along with Zia that is Zoho’s AI-powered assistant. It is also empowered with the capability of integration with Apple TV and Android. The story doesn’t end here. There is a lot more in store for an enterprise in this classy office suite. It has proprietary data cleansing and smart note card functionality. The four key components of Zoho Office Suite are Zoho Writer, Zoho Sheet, Zoho Show, and Zoho Notebook. And all have a common catalyst – Zia. Zia, in fact, is Zoho’s AI-powered assistant that has matured a lot by now. The suite, thus, enables deep contextual collaboration to help user and enterprise meet the diverse challenges and end-to-end business requirements of its users. And Zoho Suite is capable of delivering the same set of results irrespective of organization size and the number of users. Zoho Office Suite will surpass all others by 2022? Zoho Office Suite is equally good for a startup or small business as well as a large enterprise. This is the final post of the series AI for Accessibility. This first post can be accessed by clicking here. And the second post is here. This is the concluding post. Microsoft’s AI for accessibility is a 5-year program with a funding of $25 million. The target is to enhance human capabilities with the help of AI. It aims to benefit over 1 billion people around the globe with a disability. The technological advancements in AI enable it to see, hear, and reason with increasing intelligence. Some of the best use cases are real-time speech-to-text transcription, predictive text functionality, and computer vision capabilities that showcase how AI is playing a vital role in helping people with disabilities. Microsoft’s approach to accessibility can be found on Microsoft Accessibility Website and Microsoft India’s video on Empowering for Inclusion. With this, we conclude this three post series on AI for Accessibility. Any thoughts are welcome in the comment section. Inclusivity is not an initiative limited to a handful of persons. It requires involvement and engagement of each and every human being. Only then the actual targets can be achieved. Like an interpreter is a bridge between a person with a disability and a person with no disability. But in reality, isn’t the interpreter serving the purpose of both the ends? AI is the best possible way to empower people with impairment. That was the core theme of the 2-day event “Empowering for Inclusion Summit 2019” hosted by Microsoft. The sole purpose of the summit was to encourage greater coaction in order to attain optimal empowerment for people with disabilities. This can only be achieved using AI (Artificial Intelligence). This was the second edition of this initiative. The beauty of it is the evolution of this platform to such an extent that there are multi-stakeholders in it. It is the AI for accessibility technology playing a substantial role in enabling people to access, collaborate, and deliver. These multi-stakeholders include non-profits, developers, enterprises, academia, scholars, and experts. All have the common goal of creating inclusive technology solutions. The credit for the creation of this platform goes to Microsoft India who is taking a lead in enhancing it to every possible extent. The second edition of Microsoft’s Accessibility Summit – Empowering for Inclusion was held on 15th and 16th February. It was held in New Delhi in collaboration with The National Association of the Deaf (NAD) and the National Centre for Promotion of Employment of Disabled People (NCPEPD). The core theme this year was AI for accessibility. The summit plays a pivotal role in bringing together multiple stakeholders to initiate anything using inclusive technology. Catering to the enhancement of accessibility standards and giving a new dimension to policies is the primary aim to create a better accessible India. Everyone in the ecosystem has to play an important role in achieving these goals. The initiative can come from any of the stakeholders in the system like People with disabilities, policy-makers, service providers, people engaged in support systems, CSR, and developers of assistive technologies. From the IT department to the C-suite, data security has become a key priority, driven by business and competitive requirements, as well as regulations compliance. Until recently, VPNs have been considered one of the most secure methods for the transfer of data. However, recently it has become abundantly clear that in most cases VPNs are unable to meet the security requirements of today’s business environment, nor meet regulations compliance mandates. And, for many IT departments VPNs have been nothing but an expensive, time-consuming, management headache. Today, I speak with Don Boxley, CEO and Co-Founder of DH2i (www.dh2i.com) about this increasingly critical topic. Q: The undeniable benefits of the cloud have acted as a catalyst for datacenters to expand beyond their physical walls. However, this expansion also introduces potential security issues. Datacenters have typically turned to VPNs – could you discuss the plusses and minuses? Q: How are these problems exacerbated for organizations that wish to grant strategic partners access to infrastructure and information? A: Providing such access represents a critical security risk that can introduce a multitude of security threats to your enterprise. Besides the threat of potentially introducing malware into your systems, there are other possible technical and business dangers of which to be aware. First, granting system access to third parties instantly lowers your security level. If a vendor that you invite in has feeble security controls, they now will become the weakest link in your security chain. If an outside attacker compromises that vendor’s system, this malevolent force can use that as a backdoor into your network. In parallel, as that third party’s risk increases, so does yours. Some of the largest and most publicized retail data breaches in history have been linked back to third-party vendors. Q: What types of solutions/approaches overcome the limitations just discussed? A: One approach to secure remote user/partner access to cloud services is to deploy a software-defined-perimeter (SDP). An SDP starts with the question: Does every remote user/partner really need full access to my network to transact business? An SDP would enable organizations to give remote users/partners access to the specific computing services they need without giving them a “slice of the network” or put another way if you want to virtually eliminate network attack surfaces get users off your network by using software-defined-perimeters. This would be an essential component of moving the organization’s network to a Zero Trust (ZT) architecture. The analyst firm Forrester defines a Zero Trust (ZT) architecture as one that abolishes the idea of a trusted network inside a defined corporate perimeter. In the case of remote user/partner access to cloud services, ZT would involve the creation of micro-perimeters of control around computing assets to gain visibility into how remote users/partner use services/data across the cloud network to win, serve, and retain customers. Q: You recently introduced a new software called DxOdyssey. Could you tell me more about it? A: Sure. This fall, DH2i introduced new network security software product, DxOdyssey, that is specifically designed to enable the organization to dynamically deploy highly available micro-perimeters to isolate services for fine-grained user access without using a VPN. DxOdyssey was purpose-built to give medium and large organizations the perimeter security model needed for cloud-centric network connectivity with virtually no attack surface. Q: I believe that this is something that anyone that is concerned with the data security of their organization should check-out. Where can one go to learn more? A: Please visit http://dh2i.com/dxodyssey/ for more information and/or to schedule a live demo. Are You An Expert In Exploratory Testing? Check It Again! You have not to be critic about everything that happens in life. But when it comes to testing a piece of code or a complete application, you should not accept what code says about it. You have to look at it as a critic and find out all kind of possibilities that can go wrong in the successful running of this code. All kind of permutations and combinations have to be taken care of. Everything has to marry well between the business requirements and the code. The flow of application has to gel well with the business processes and flow. At times things will not be as straight as they might appear. The report might say everything is developed as per the requirement but still something might be there beneath the carpet. You might be required to dig down further to get to the other side of the iceberg for a reality check. After all, when a product or software is released, the whole organization’s reputation is at stake. Everything might not go as smooth as free-flowing water in a river. You as an expert in exploratory testing has to cover a longer distance than a normal routine. You have to stay calm under all adverse situation with one goal in mind and that is to find out the minute of the bug in the software. You have to be a good storyteller when it comes to explaining a bug in software to make the other person understand it to the core so that the next time no mistakes repeat. Besides being an expert storyteller, your communication skills have to be extraordinary. That can happen only when you have clarity about everything you discover and its difference from what it should behave like. If you can convince yourself about a thing, you can very well convince others about the same. And that is a must in exploratory testing. If you are in project management the first and foremost important thing to check in your project management lifecycles if you have a place for requirements analysis. In my opinion, the requirements analysis is entirely different from requirements gathering. It includes requirements testing and validation along with parallel scrutiny with actual business processes in place. If you don’t perform all these and start your coding, you are definitely calling for big trouble at a later stage. It may, in fact, lead to an entire failure with a big setback to reputation, finances, business, customer loss, and time. Any project failure leads to a risk of losing the best talent in the pool especially if the project is not managed properly. Obviously, the best of the people would not like to stay at a place where risks and mistakes have a higher stake in the projects. It is very important to learn the deep connection between requirements analysis and testing your requirements. Knowing that testing requirements are very important is one thing, how to do it in the best possible way to avoid later accidents is an altogether different ballgame. As a matter of fact, the requirements analysis stage has to have ample time and best of the resources to ensure foolproofing in a wholesome manner. Once the coding starts, the entire focus shifts to timelines, testing, and execution. The analysis stage is over by then or it takes a backseat by then. A thorough QA check of business requirements, processes, wireframes, and mockups are very important before the beginning of coding. Anything in the requirements that is not testable is risky. Business scenarios and test cases have to be complete and clear. Anything vague is meaningless. There has to be a perfect strategy. As a matter of fact, any coding and later the implementation has to align well with one or the other requirement well. If it doesn’t, there was something wrong with the requirements analysis. – John Janetos, Director, Business Development, CloudPassage. – Connor Cox, Director of Business Development, DH2i (http://www.dh2i.com/). – Rajesh Ganesan, director of product management, ManageEngine. – Jason Dettbarn, CEO, Addigy. Two significant fears I remember regarding adoption of Macs we used to have when I was working with various enterprises as CIO/CTO was lack of support and visibility. Plus the exorbitant prices of Mac desktops at that time. Apple devices used to be a sign of luxury. That fear was across almost all enterprises and CIOs. But that is not the case anymore. When I spoke to CEO of Addigy Jason Dettbarn I realized that. Both the fears are no more there in existence. For enterprise support, Addigy is there to manage any size or volume of macOS/iOS ecosystem in an enterprise. And as far as pricing is concerned, Mac systems are well within the reach and not too high in comparison to Windows PCs and laptops. Looking at the advantage and reliability of Mac systems bring, even if there is a slight price increase, it is worth accepting. Addigy recently released strategies to ensure macOS/iOS readiness for the enterprise. The strategies include a good amount of groundwork behind it. The company highlights processes and procedures to strengthen macOS/iOS system management, security, and compliance. Addigy is a front-runner in providing cloud-based Apple device management software. Thus irrespective of geographies, the company is fully capable to support any enterprise across the globe. The latest release includes a seven-point checklist to ensure macOS/iOS enterprise readiness. Last decade has seen substantial growth in popularity of macOS/iOS devices for their significant enhancements in productivity, least help desk needs, fewer management costs, and unmatched overall user experience. The deployment of macOS/iOS devices, however, in the enterprises seems to be a difficult task to the administrator thinking it as a cumbersome process taking several steps to make the devices ready to match the security and regulatory computing environments. Q: How are IO filters used for cloud DR? With data replication from the on-premises environment to a cloud service provider, the service provider can host a warm failover destination for the VMs running at the on-premises data center. With the same method of intercepting data on-premises, the data can be continuously replicated to a cloud object store for recovery. Data may be preprocessed for the destination through the specific object store’s APIs. Again, no snapshots are required. By replicating data in a continuous stream instead of discrete snapshots, point-in-time navigation is possible for recovery of all data up to immediately prior to a critical event (e.g., malware intrusion). Rather than requiring a “like-to-like” model for cloud data protection, data replication from within the hypervisor itself can provide DR for Virtual SAN or third-party HCI, even if the cloud destination is running entirely different compute and storage hardware. 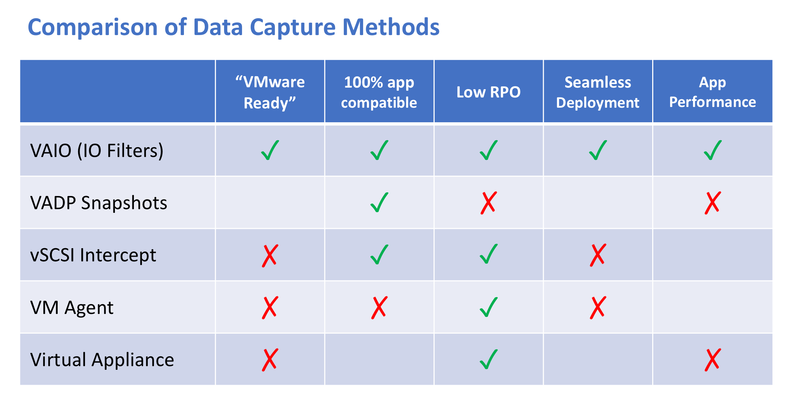 Q: With respect to cloud DR, how do IO filters compare to other data capture methods? A: IO filters enable a continuous capture of data from within vSphere, which is a game-changer for cloud DR. Traditionally, organizations have looked to the cloud for snapshot-based backup, which has its place, but it is quite limited in terms of realizing true DR as a cloud service. It’s well understood that snapshots degrade application performance and by definition don’t support continuous replication. The tradeoff with snapshots is the shorter you want your RPO to be, the more snapshots you create, so the greater impact on runtime performance. Also, recovering a volume from many small snapshots will increase RTO. For true DR from a cloud service, continuous data replication from an IO filter gives a better, more efficient approach. Prior to the availability of IO filters, continuous data capture was possible, for example, by intercepting data in a vSCSI filter. This is how vSphere Replication accesses data as it makes snapshots for data recovery. The key problem with vSCSI is that it’s a private API intended for VMware’s use, and VMware provides no guarantee of support for third-party technologies that use vSCSI intercept. Another approach to continuous data capture is to install agents inside the VMs to replicate data in a stream. While this method can achieve RPOs of just seconds, it is an agent-based solution, which may raise concerns about security and compatibility. Lastly, virtual appliances typically run within their own VMs, so they are broadly compatible, and they generally don’t take snapshots, so they can stream data. The problem is that they either stand in the data path itself, introducing IO latency, or they require a filter or agent to intercept data. Q: What’s next for IO filters? A: While the IO filters API is primarily of interest to software developers providing data management services in the VMware ecosystem, interest has been growing recently, driven primarily by cloud and hybrid cloud use cases. In the future, it’s not difficult to see IO filters applied for uses beyond performance acceleration, live migration, and data protection to other types of policy-based data management. The idea of cloud services moving beyond disaster recovery and data protection solutions is feasible with on-premises IO filters enabling “X as a service” offerings, with the application of specific policies to data across an infrastructure comprising on-premises operations and cloud services. With an IO filter in each VM on premises, a solution can intercept and process every bit of data moving up and down the storage stack, and it can help the admin set data policies for those VMs, for any type of business requirement, such as cloud cost optimization or compliance. The key is that there is no need for an external data management framework — policy-based data management can be enabled within vSphere itself — across multiple data centers and cloud services. 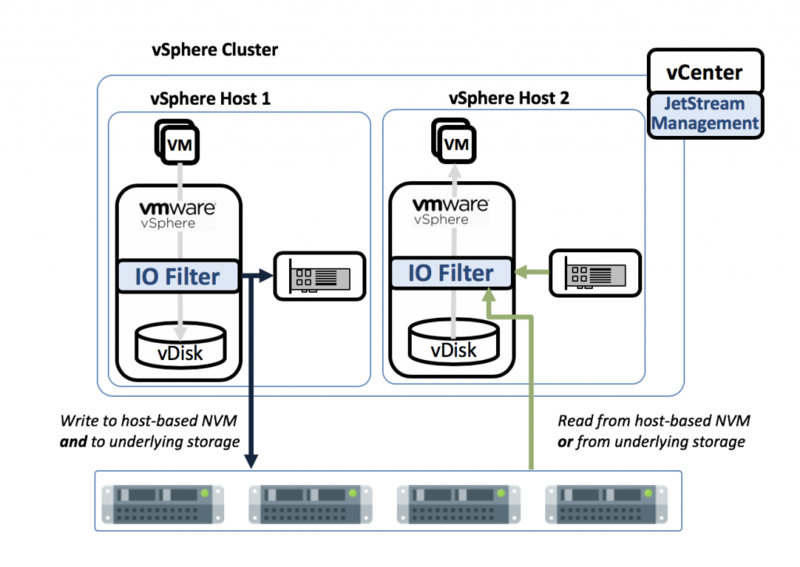 Q: How are IO filters used for virtual machine live migration? A: The problem with live migration is this: How do you keep applications running, with new data being written continuously, during the hours — or sometimes days — that it takes to move the applications’ data to the destination? There are a number of approaches, as virtual machine migration is not a new problem. But IO filters provide a capability that’s much simpler than anything we’ve seen before. With JetStream Migrate, the software deploys as a replication filter in the source VMware environment. The migrating VMs’ configurations and virtual disks are copied from the on-premises data center to the cloud data center, and while that copy and transfer process is taking place, newly written data from the VM is captured by the IO filter and also replicated to the destination. One of the advantages of this approach is that the copy of the virtual disk can be moved over the network connection, or it can be copied onto a physical device for “offline” transport to the cloud destination. So if you are familiar with the Amazon Snowball, it’s now possible for an organization to use a snowball-like device to transport data from one VMware environment to another VMware environment, without having to stop the VMs or their applications from running at the source. Q: With respect to disaster recovery (DR), why would someone use IO filters instead of snapshots? A: One of the key goals for using IO filters for data replication is that — unlike snapshots — data can be captured for replication without a detrimental impact on application performance. Also, because data is being captured in a stream, there are better options for delivering a variety of DR capabilities, such as an extremely low RPO and RTO, as well as very fast point-in-time recovery. Q: What are the advantages of IO filters? 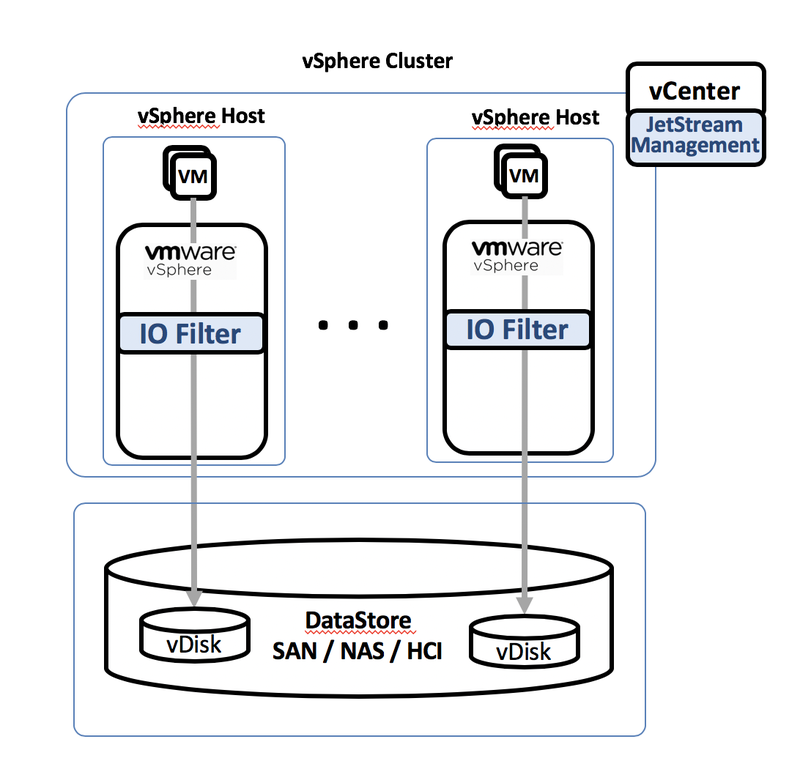 A: First, and perhaps most obviously, because IO filters run within vSphere, they truly achieve the goal of enabling “software-defined storage.” IO filters are designed to run with any type of datastore, including shared storage, VSAN/HCI or Virtual Volumes. Second, among the various software-oriented approaches to integrating third-party data services with vSphere, IO filters are the most “vSphere native.” IO filters don’t use any agents in the VMs, virtual appliances in the data path, third-party modules in the kernel, or calls to internal APIs. Solutions deployed as IO filters provide an assurance of support, compatibility, and stability that other approaches to software-defined storage can’t match. Of course, this becomes doubly important when we’re talking about cloud or hybrid cloud deployments, where abstraction is paramount. Q: How are IO filters used for storage IO acceleration? A: Storage IO acceleration was our first application of IO filters; it’s why VMware selected us to partner with them, as our IO accelerator served as a kind of reference architecture for the API as it was in development. JetStream Accelerate uses the caching filter to enable virtual machines to write data to a non-volatile memory device in the host servers so that when the time comes to read the data, if possible, the VM will read that data from the non-volatile memory cards or SSDs rather than having to traverse the SAN to get the data from the underlying storage. Reading data from host-based flash generally enables much faster application performance, and with sufficient memory and CPU, it allows increased virtual machine density as well. Host-based data access is especially important for latency sensitive applications, and data center operators also like the idea of deploying two to three times as many VMs on the same number of host servers without any performance penalty, just by reducing storage IO latency. Enterprises also benefit from greatly reduced storage overhead. For example, in an Oracle environment at a large telecom customer, we are seeing a 90 percent reduction in read operations against their storage arrays. That means that because they’re serving those operations from flash within the host systems, they don’t need to overprovision their storage for performance, saving a lot of money on their storage budget. This post is in continuation to the previous post. This is the second post in the series. We are in conversation with Serge Shats, Ph.D. about Hybrid Cloud Services for VMWare and IO Filters. Shats is co-founder and CTO of JetStream Software. He has more than 25 years’ experience in system software development, storage virtualization, and data protection. Previously co-founder and CTO of FlashSoft, acquired by SanDisk in 2012, Shats has served as a chief architect at Veritas, Virsto, and Quantum. He earned his Ph.D. in computer science at the Russian Academy of Science in Moscow, Russia. For more information, please visit www.jetstreamsoft.com, www.linkedin.com/company/jetstream-software-inc/ and @JetStreamSoft. Q: What are IO filters? Q: How do IO filters work? 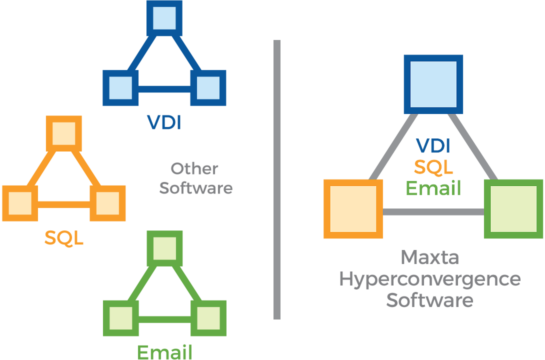 Over the past few years, we’ve seen a lot of new features introduced to the VMware platform. Many of these new developments were undertaken to make VMware an even better cloud and hybrid cloud platform. One of the less well-known developments may be one of the most important: IO filters. 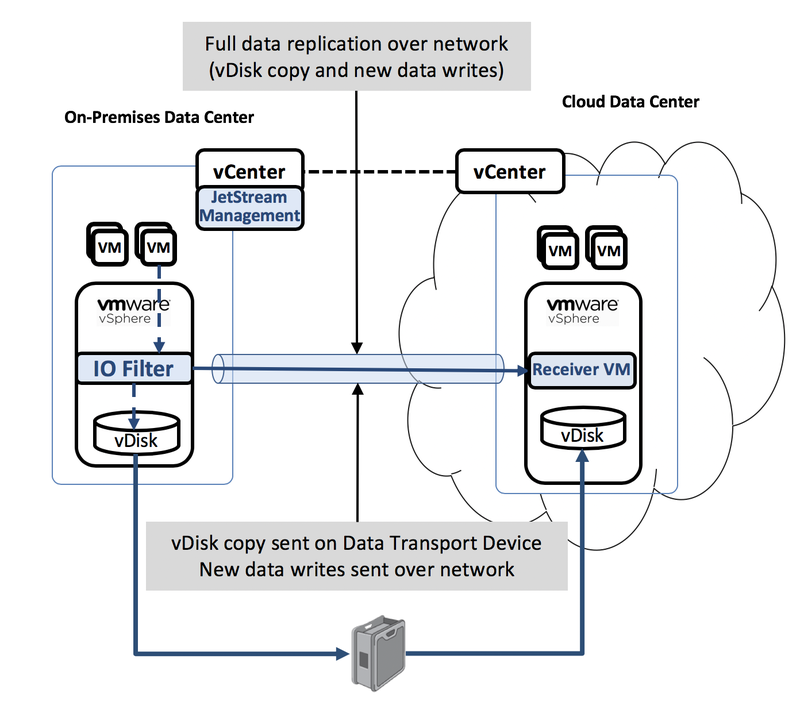 As organizations shift some or most of their infrastructure to cloud-based services or consume cloud services for data protection and business continuity, IO filters are becoming key to accomplishing some important capabilities, such as migrating VMs without interruption and protecting VMs in an on-premises data center from a cloud service. The VMware vSphere API for IO Filtering (VAIO) represents a significant step in how VMware can be used in cloud and hybrid cloud environments. We recently chatted with Dr. Serge Shats, CTO and co-founder at JetStream Software, about the company’s role in developing and applying IO filter technology for cross-cloud data management. Serge has led architecture and development at storage and data protection companies including Veritas, Quantum, and Virsto. He was CTO of FlashSoft Software, then engineering fellow at SanDisk after the company acquired FlashSoft. Q: Tell us about your role in developing the API framework for IO filters. A: Starting in 2014, while our engineering team was still at SanDisk, we began collaborating with VMware as the co-design partner for the IO filters API, so we have a rather extensive understanding of the API. It is a standard VMware API, and solutions that support the API are listed in the VMware Compatibility Guide and are certified “VMware Ready.” The VMware Ready certification ensures full support from VMware. JetStream Software has a large number of deployments of the software, mostly in large data centers running VMware for public and private cloud operations. Microsoft Azure monitoring becomes stronger and easier with the help of AI-driven technology developed by Site24x7. Similarly, the technology also assists in Microsoft Teams Chatbot Integration. Let us understand how does it help the client in a substantial way. The foremost benefit the client gets is a drastic decrease in application outage resolution time with the help of AI-powered insights. Interestingly DevOps and application teams remain in the zone of work even while IT incidents happening. This happens with the help of Site24x7 chatbot for Teams. The good thing is, it is a cloud-based performance monitoring solution that works now more efficiently for DevOps and IT Operations. After this launch, IT teams can now manage more than 100 Azure products using Azure Insights API. All this happens in near real-time hence empowering IT teams to get timely alerts and thus taking appropriate action proactively thereby bringing down resolution time significantly. All this definitely helps in gaining higher visibility of the organization into their hybrid clouds. 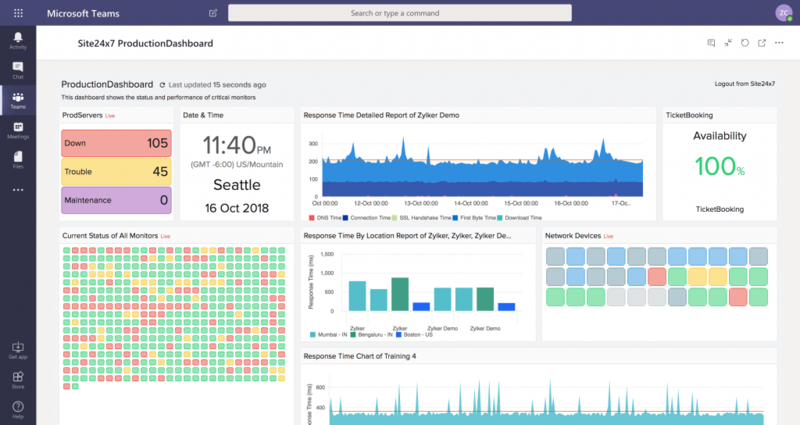 Actually, after the deployment of Site24x7 chatbot for Microsoft Teams, it becomes quite easier for DevOps and application handling teams to gain a real-time picture of the health status of critical applications right in their workplace chat room. In fact, with the growing adoption of the hybrid cloud environment, the monitoring load increases in the sense that now the teams have to monitor not only the on-premise environment but also the multiple cloud system. The pace at which the global hybrid cloud market is growing is really phenomenal. From around $50 billion in 2018, it is estimated to touch almost $100 billion by the year 2023 as per MarketandMarkets, a B2B research company. If this growth has to sustain or go higher, a strong solution like Site24x7 needs to be in place. Early access program opened December 11th. General availability begins in Quarter 1, 2019. Elastifile and Google Cloud introduce scalable, fully-managed file service for Google Cloud. Yes, we are talking about Enterprise Cloud Adoption the way future needs it. The way Google and Elastifile design it to tackle all current and future requirements of any enterprise. The solution aims to bridge traditional and could-native architectures including Kubernetes, Preemptible, Compute VMs, and Kubeflow. The key features include data persistence for Kubernetes, data resilience for preemptible cloud VMs, and mobilized machine learning. The solution becomes stronger and intelligent as it grows with the time post-deployment. The target business verticals include media & entertainment, manufacturing, life sciences, and traditional enterprise IT to name a few. But the solution is not limited to these verticals only. Any other medium to the large-sized enterprise can adopt the solution and leverage its futuristic strengths. Enterprise Cloud Adoption needs a highly Scalable Cloud File environment. This solution that we are talking about is designed to serve a broad spectrum of enterprise applications of any size and scale that require file storage. It is designed for standard protocols like NFS. In addition, it consists of a full suite of enterprise features like snapshots, multi-zone access, and so on. The solution would be the right fit for any industry vertical in my opinion. Especially those where the data grows at a phenomenal pace and needs best class file storage provisions. Its flexible service class options empower a business to gain access to unlimited snapshots. In fact, snapshots price astonishingly will be as low as $0.03 per GB per month. That is how it aligns cost and performance to any business need. There are three different models to chose from depending on an enterprise’s basic requirements. The first option of Enterprise Cloud Adoption from Elastifile leverages Elastifile ClearTier technology. This technology integrates standard persistent disks and object storage within a POSIX-compliant, unified namespace. Typical performance: 2 GB/s BW @ 120 TB capacity. The cost? It is just $0.10 per GB per month. The effective cost comes out to be w/ 30% snapshots: $0.08 per GB per month. This option is ideally suitable for capacity-driven, cost-sensitive use cases. The second option leverages Elastifile ClearTier technology to integrate SSD persistent disks and object storage within a POSIX-compliant, unified namespace. Typical performance: 10 GB/s BW @ 120 TB capacity for active data. If the first option is for capacity optimization, this one is for general use. The cost would be $0.17 per GB per month. Effective cost w/ 30% snapshots: $0.13 per GB per month. As said, this is for general purpose use. The third option of Enterprise Cloud Adoption from Elastifile aggregates SSD persistent disks into a POSIX-compliant, unified namespace. Typical performance would be 15.6 GB/s BW @ 120 TB capacity. It provides high transactional performance, scalable to millions of IOPS. That is just phenomenal. Isn’t it? It is for businesses who want performance optimized. Cost? Just $0.30 per GB per month. Effective cost w/ 30% snapshots: $0.22 per GB per month. Ideally for workloads requiring high performance. Elastifile Enterprise Cloud Adoption solution is a cloud-native, truly software-defined service architecture. In addition, it is future-proofed to seamlessly leverage cloud technology advancements for years to come. It would be something significant obviously when a technical support services firm Trusource Labs LLC banks on Maxta Hyperconvergence software by Maxta Inc. Trusource Labs specializes in support for the IoT (Internet of Things) providing helpdesk services to the organizations using Apple devices. In fact, its customer range is quite versatile. It consists of startups on one hand and Fortune 100 companies on the other hand. The biggest challenge for this 2013 founded company in Texas was to ensure a strong collaboration with a scalable, flexible solution for supporting their growth outpacing in legacy IT infrastructure. Within 3 years, Trusource Labs was adjudged as the fastest growing business in Central Texas. Starting with just 20 employees in 2013, Trusource has now more than 600 employees. In addition, they have just started their international operations from Limerick, Ireland. That is a phenomenal growth. Maxta had a substantial role in it. Oklahoma Wesleyan University with over 2000 students and 500 staff had a number of specific challenges. They were finding it difficult to manage their storage array that was running out of space. An investment of $30,000 for additional capacity was almost out of question. They wanted to opt for hyperconverged appliances but that too was a very expensive solution in terms of opex and capex. That is when they found a highly cost-effective hyperconverged infrastructure that was at par with industry standard servers. It had a comfortable ability to scale both, storage or compute as and when required by the university. The solution, in fact, was radically simplified storage management with no more LUNs (Logical Unit Numbers), provisioning, or a cumbersome capacity planning. The solution was in this case too was Maxta Hyperconvergence Software. Texas Southern University is a much larger university in comparison to Oklahoma Wesleyan University. It has around 10,000 students and 1,500 staff. It had almost similar challenges in terms of their IT infrastructure. The existing traditional storage arrays were more than difficult to manage, mostly leading to misconfiguration. There was an overall lack of common management of storage arrays with a regular IT staff turnover. The university was badly in need of a simpler way to manage storage resources without hiring a storage administrator per storage array. After a good amount of research in the market, they found Maxta’s Hyperconvergence Software solution that was capable of delivering a complete and cost-effective mechanism to manage primary workloads utilizing TSU’s existing hardware assets. There was no need for specialized storage management resources. Capacity upscaling was quite easy by adding into an existing Maxta node rather than adding a complete node. TSU had a capability of refreshing server hardware without needing a repurchase of the hyperconverged software license. “With hyperconverged infrastructure, we can further utilize our hardware investments while bringing the data as close to the CPU as possible,” says Kelly Dean, Senior Systems Administrator, Texas Southern University. “That was one of the most important things, trying to not only simplify from a management perspective but also simplify in terms of the sheer number of pieces involved. In addition, I am looking at it from the perspective of, ‘What if I ever leave here? Can somebody come up behind me and understand how this works? You have to leave a place in a better state than when you got there,” concludes Dean. hardware investment. That’s not really scalable. We run a pretty tight ship in our engineering department. I don’t want to have onsite engineers at every location. We can remotely manage all this stuff. Because Maxta is so maintenance-free, I don’t have to double or triple or quadruple my staff. If you calculate that cost over years and years, I’m saving a ton of money.” he concludes. “A lot of the options were really expensive. I was initially looking at Nutanix and VxRail, trying to figure out how to afford to put that in my environment,” says Eric Goings, CTO, Oklahoma Wesleyan University. “Ultimately, Maxta is going to save us a lot more money than just the initial up-front cost,” he concludes. A recent interaction with DH2i CEO and Co-Founder, Don Boxley about the key technology transformations in 2019, he talks about two key developments he foresees in 2019 regarding IoT and Hybrid Cloud. So, his 2019 predictions go as follows. The first prediction says Enterprises will replace VPNs with micro-perimeters. This will become important for them in order to secure IoT gateway communications. This clearly means VPNs will vanish and so will the threats and vulnerabilities associated with them. Security is obviously the prime priority for enterprises. The dependence on data, technology, and the internet are at its peak. This comes with a bundle of threats though. But exploring and using technology is inevitable. It is the basic necessity now. The new product differentiator for enterprises is making smart products and IoT devices. Most of the devices are coming with IP addresses. Organizations are investing in IoT initiatives. Organizations understand very well that the IoT gateways layer is the primary key to gain a high dividend on those investments in IoT initiatives. As we all know IoT gateways involve device connectivity, protocol translation, updating, upkeep, management, predictive and streaming data analytics. Not only that, in fact, it also involves a greater volume of data flow between devices and the cloud. Opening so many gates definitely increase the risks and this seeks a high level of improvement in the security of that high volume of data flow. Nothing better than a Zero Trust security model will work in such cases. Enterprises will have to replace VPNs with micro-perimeters if they have to secure IoT and Hybrid Cloud spectra. Micro-perimeters, understandably, remove an IoT device’s network presence thereby eliminating any kind of potential attack that is there in VPN. 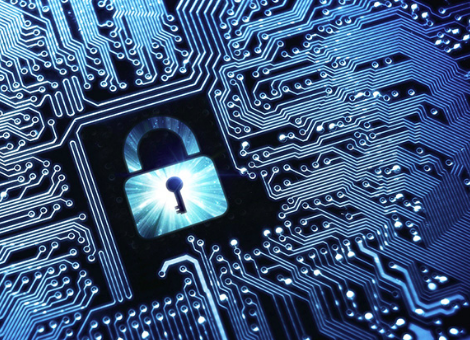 Zero Trust hybrid cloud security will become most critical. While many organizations are drafting or following a hybrid strategy to manage IoT and Hybrid Cloud. This strategy involves a deep integration between on-premise systems and off-premise cloud/hosted resources. VPN software solutions are getting obsolete in wake of the new IT world of hybrid and multi-cloud environments. Because VPNs were never designed keeping these newer transformations in mind. And if you try to align VPNs with these newer environments to create a secured world, it would be too complex to achieve. Moreover, VPN means a slice of the network for each user that easily create a lateral network attack surface with a higher amount of risk. The need is very different now. Enterprises require a new class of purpose-built security software if they have to do away with these risks. Definitely, the new oil is data. 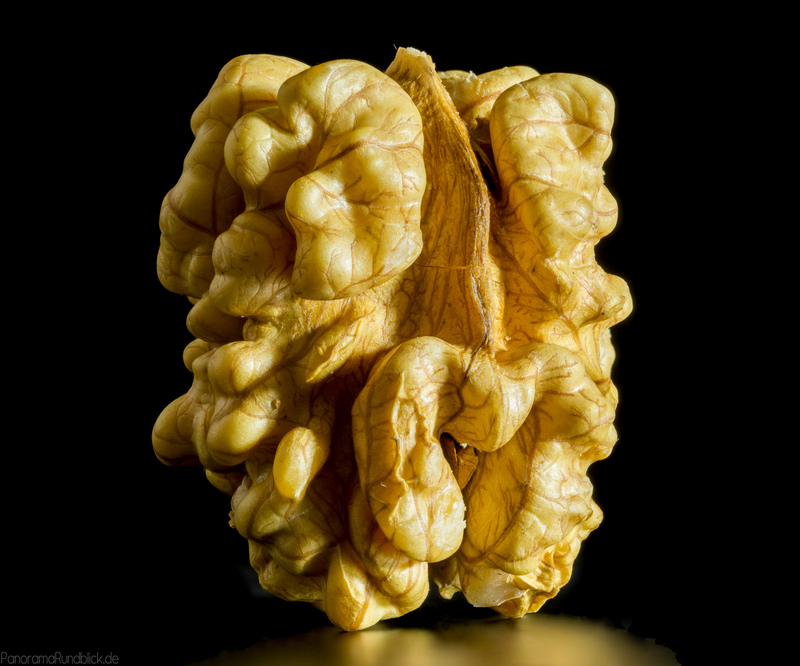 And looking at an increase in its exponential increase and importance, it needs an utmost attention towards its protection, safety, and availability. Any organization that brings out an innovative breakthrough in any of these three segments would immediately meet tremendous attention and response. NAKIVO brings a breakthrough solution for data protection automation. This includes backup and replication. In fact, it brings automation of core data protection tasks to its next level just a week ago. The solution includes a significant and unique functionality that empowers NAKIVO customers to put their VM data protection on an auto-pilot mode. This, in turn, simplifies data protection management providing a risk-free environment that any enterprise would need. NAKIVO Inc., a software company, is growing quite fast in virtualization and could backup spectrum by bringing unique and valuable solutions for the enterprise world. The latest data protection automation solution is a part of NAKIVO’s Backup & Replication v8.1 release on 3rd. This is a revolution in helping businesses to manage their data protection chores by means of automation thus reducing manual intervention to a large extent. In addition, the release also includes universal recovery of any application objects. The two key points to note about this solution are – (a) Policy-Based Data Protection, and (b) Universal Object Recovery. As we all know, managing a large array of VMWare, AWS, or Hyper-V infrastructure is a difficult task. NAKIVO Backup & Replication v8.1 thus focuses on Policy-Based Data Protection. This means the customers can now create a backup, replicate, and backup copy policies to fully automate data protection processes with an easy configuration and good amount of flexibility. The policy parameters can be VM name, location, size, tag, power state, or any combination of these. Once the policies are set up, the system takes care of scanning the whole infrastructure for VMs defined in the criteria and ensure complete protection of the VMs in an automated manner. This means now all critical VMs and ECs instances can be provided complete protection with almost zero manual input. That is, actually, a remarkable achievement. Similarly, the Universal Object Recovery ensures customers successful recovery of any application objects back to the source, a pre-defined location, or a physical server. This, in turn, saves a lot of valuable time and resources that an enterprise spends on restoration. A step ahead, the customer gets a leverage of recovering individual items from any application or file systems by mounting VM disks from backups to a target recovery location. The best part is, it doesn’t require to restore the entire VM first. Bruce Talley, CEO of NAKIVO Inc. says, “ We are expanding our product’s functionality to further improve reliability, flexibility, and ease-of-use. Policy-Based Data Protection in v8.1 is yet another significant step in this direction. By fully automating core data protection tasks, NAKIVO Backup & Replication minimizes the possibility of human error and helps customers gain more confidence in their data protection strategies.” NAKIVO is the winner of “Best of VMworld 2018” and the Gold Award for Data Protection. That itself speaks about its consistent growth and path-breaking VM Backup and site recovery solutions it brings on the table. And now an ultimate solution in Data Protection Automation that makes it a consistent pioneer in this field. Honda, China Airlines, and Coca-Cola are a few names in their customer list of a large number of enterprises worldwide. You name a global standard storage system and it gets a full support of NAKIVO solution. So whether you are using a storage system like Synology, Western Digital, QNAP, ASUSTOR, or NETGEAR; and/or a high-end deduplication appliance like Dell/EMC Data Domain or NEC HYDRAstor, you can be assured to get a 2X performance and protection advantage with NAKIVO solution. Obviously with its new Data Protection Automation solution, this performance and protection increases manifold thereby providing enterprises a risk-free environment. The trial download is available here. To read some of the great success stories, click here. A Datasheet for reference is available here.